Kevin Hart – the new black superhero? A white milksop businessman (Will Ferrell), sentenced to jail for a crime he didn’t commit, enlists the aid of a black car washer (Kevin Hart) whom he thinks has done jail time, to help him survive incarceration. 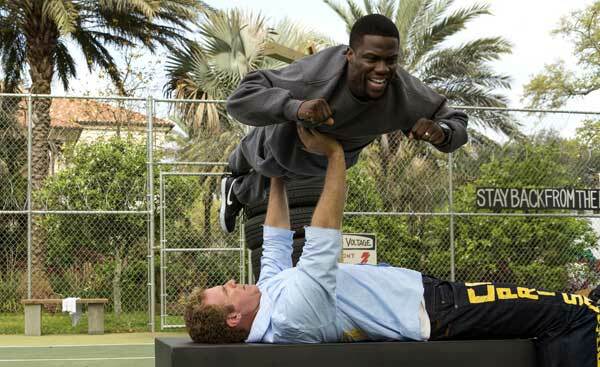 Formulaic fish-out-of-water story with obvious plot and results, GET HARD is yet another vehicle for Kevin Hart to shine in, doing his Vince Vaughn Black (in what seems to be his 20th movie this year alone); while Ferrell coasts along as usual, allowing the comedy to hit him in the face inadvertently, rather than delivering it proactively. Kevin Hart is really the only person worth watching. With each movie role (starring or supporting) he seals his place as the new African American IT-boy, the go-to comedian for roles that used to be Eddie Murphy’s or Chris Tucker’s. Supreme confidence, shotgun delivery, lightning role-playing, a whirling dervish of loudmouth energy. We cannot tell whether he is scripted or unleashed to ad-lib, as he loads so much of himself into the delivery. Witness the genius scene in “The Yard” where he switches between three characters in quick succession. In the grandest tradition of Jerry Lewis or Jim Carrey, he alters voices, stances and mindsets in milliseconds, the one physical cue to differentiate the characters, his wool cap – black “Lee Roy” wearing it normally, Mexican “Carlos” wearing it down over his eyes, and gay “Dante” taking it off. An astounding performance that leaves us – and Will Ferrell, and Ferrell’s character – completely befuddled! Movie is a puddle of clichés, sprinkled with a few laughs and the usual mundane Will Ferrell shtick, but watching Kevin Hart – I’m totally hard. Writers: Jay Martel, Ian Roberts, Etan Cohen, Adam McKay. Starring: Will Ferrell, Kevin Hart, Craig T. Nelson, Alison Brie, Edwina Findley Dickerson, Ariana Neal, Erick Chavarria, T.I., Paul Ben-Victor, John Mayer, Jon Eyez, Nito Larioza, Dan Bakkedahl, Greg Germann, Ron Funches, Matt Walsh, T.J. Jagodowski.